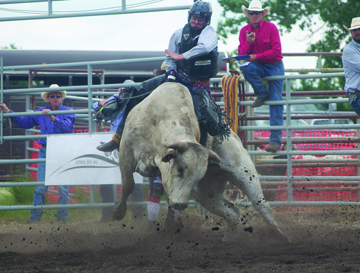 Local Quade Hughson rides to victory during the junior bull riding event. Mother Nature decided to co-operate after a downpour upon completion of Friday night’s rodeo, allowing for ideal conditions on Saturday during what was an exciting 71st annual Foremost Agriculture Society Rodeo over the weekend. “We had a very successful day yesterday,” said Foremost Agriculture Society president Craig Walsh. “Our slacks went off beautiful. Our evening performance was excellent. We got done before any showers came over. The most noticeable difference at the rodeo is that local cowboys and cowgirls “make a special effort to be here,” and opt out of other rodeos to ride here, he said. He added that it helped with a younger crew getting involved in rodeo a couple years back who came in and knew the situation and were able to bring the rodeo to current to keep people interested. On the other hand, the rodeo has been going for 71 years, so there is an upside with experience and the rodeo crew has stuck with their style and it has worked for a long time with the beer garden and concession. “People know they have to do a shift in the concession,” he said. Michelle Cowie is a member of the agricultural society with her husband Jess, the rodeo’s vice-president. Their roots have always revolved around ranching and volunteering at the rodeo in their hometown. They’re parents to a little girl. With their volunteer efforts, their daughter can enjoy the rodeo too, said Cowie. “It’s been going for a long time and it’s a big community event,” she said. New this year was the restructuring of the wild cow milking, where a team used to be entered, but it was getting to a stage of being competitive and now it went to draw system, while on Sunday there was a junior bull riding and team roping jack pot. Quade Hughson won the junior bull riding jackpot, Cale Simanton won the free style bull fighting, while the team of Dustin O’Donnell and Chase Kellet took home the team roping jackpot.